Justin Sullivan/Getty ImagesSen. Bernie Sanders speaks during a healthcare rally. 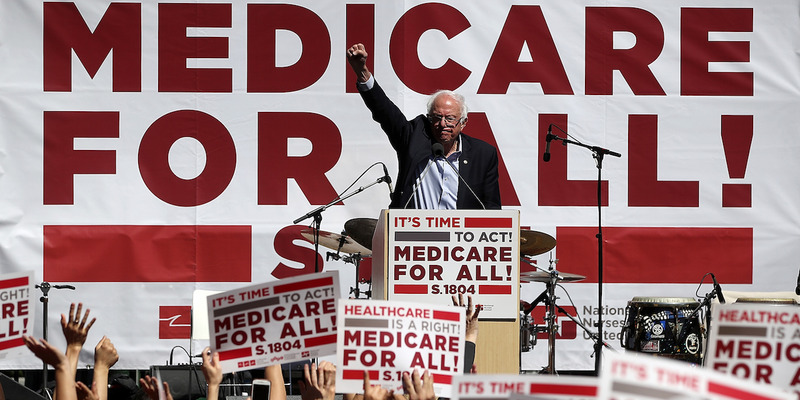 Democrats are increasingly supporting “Medicare for All” – a single-payer healthcare system championed by Sen. Bernie Sanders and the progressive wing of the party. President Donald Trump and the GOP are beginning to attack the proposal – perhaps a sign of its political salience. But it remains unclear exactly what version of Medicare for All Democrats support, and it remains to be seen how politically feasible the policy is. President Donald Trump agrees with Democrats on a key political reality: the importance of healthcare to the American voter. In a sign of Medicare for All’s political salience, Trump this week penned a rare op-ed slamming the progressive proposal, calling it the first step toward socialism and falsely accusing Democrats of plotting to “eviscerate” Medicare and hurt seniors – a key voting bloc. In a signal of the shifting parameters in the healthcare debate, former President Barack Obama endorsed Democratic calls for Medicare for All in a speech in Illinois in September. “Democrats aren’t just running on good old ideas like a higher minimum wage, they’re running on good new ideas like Medicare for All,” he said. While the term is newly ubiquitous, the concept of universal public health insurance has had support in the US for more than a century, although its popularity and perceived political feasibility has fluctuated over time. A year ago, Sanders introduced his “Medicare for All” bill, which would expand the popular government benefit into a health insurance program for all Americans, rather than just those over 65. Marking a shift in the Democratic Party, 15 other senators – many of them on the unofficial list to run for president in 2020 – signed on to the bill. More than 120 Democratic House members support the lower chamber’s nearly identical version of the bill. While there are multiple Medicare for All bills in Congress, the leading model is Sanders’, in which there would be no private insurance plans, Medicaid, or other government health plans, but instead a single, nationally-run health insurance program. Under the current system, consumers pay a monthly premium to a private insurer which in turn pays doctors and healthcare providers when a consumer receives care. Patients on private plans and some government plans are also expected to pay deductibles, an annual out-of-pocket amount, before insurance kicks in, and co-pays, an out-of-pocket cost that splits the price of care with the insurer. Medicare for All would do away with all of those payments, instead creating a new tax for both employers and households as well as bumping up some existing taxes to help fund payments. The program would also redirect all current federal funds spent on Obamacare insurance premiums and other federal healthcare programs to the new program. Doctors and healthcare providers would receive reimbursement from the government at a rate set by the Department of Health and Human Services. Sanders’ plan would set those reimbursement rates at the current Medicare levels, which are typically much lower than what healthcare providers receive from private insurers. The program would also do away with what is known as balance billing, which allows providers to directly charge the patient the difference between their reimbursement and their estimated cost for providing a service. The government would first expand the current Medicare benefits to include types of care currently not covered, like vision and dental. Then the age of eligibility for Medicare would drop every year over the course of four years until all Americans qualify. Newborns would be automatically enrolled in the program. Sanders’ plan involves the most wholesale overhaul of the healthcare system, but is not the only idea Democrats are floating. Other members of Congress have proposed plans that would create a federal option for people of all ages to purchase a federally backed health insurance plan similar to Medicare or Medicaid. This plan would not replace private insurance, but rather act as another option alongside private coverage. A recent Reuters/Ipsos poll found that 85% of Democrats, 52% of Republicans, and 70% of Americans, overall, are in favour of Medicare for All. Nearly 60% of Americans favour a national health plan in which Americans would be insured by the government, according to a March poll conducted by the nonpartisan Kaiser Family Foundation. And when the policy involves a public option with the ability to keep a private plan, support for the proposal jumps to 75% (including 64% of Republicans). 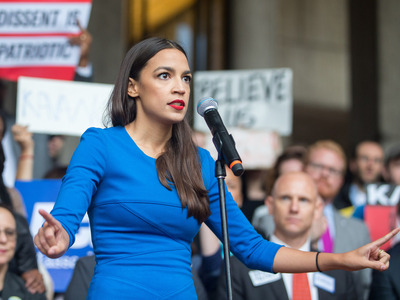 Scott Eisen/Getty ImagesNew York congressional candidate Alexandria Ocasio-Cortez ran and won her Democratic primary on a platform that included Medicare for All. Medicare’s strong brand is likely a reason why the proposal is so popular. Polling by the progressive policy group Data for Progress found that support jumps from 51% to 60% when the term Medicare for All is used, rather than single-payer, to describe a universal healthcare system. “Americans tend to dislike the idea of big government, but they like specific big government programs. By tying universal healthcare to popular programs like Medicare and Medicaid, progressives can build support for a massive expansion of the social safety net,” Data for Progress cofounder Sean McElwee told Business Insider. In a testament to Medicare’s popularity, Republicans are attacking Medicare for All by arguing the plan would “raid Medicare to pay for socialism,” as Trump put it during an August rally. Conservatives and other opponents of the proposal raise a host of issues with the plan. The most cited objections are cost, reimbursement rates for providers, the potential for healthcare “rationing” or longer wait times for care, and the potential stifling of pharmaceutical experimentation. Given the variety of versions of Medicare for All, it’s clear Democrats are not quite on the same page when it comes to defining the policy. Single-payer proponents argue the party shouldn’t compromise in their quest to transform the healthcare system, while more cautious Democrats want to avoid a political minefield that could threaten candidates in competitive races and save a debate over the details for later. “Obstacle number one is the corporate opposition, obstacle number two is the potential that Medicare for All could be co-opted or sort of mutated into a lesser thing,” Gaffney told Business Insider. Kara Eastman, a Medicare for All-supporting progressive running for a US House seat in California, argued that voters of all political persuasions are “craving authenticity and integrity” on the ballot this year, and that candidates should be clear about where they stand. “Whether things are politically feasible right now – I don’t think that should stop a candidate from laying out a vision for what we stand for and what we believe in,” Eastman told Business Insider. Other supporters of single-payer argue that Democrats should stake out an aggressive position on Medicare for All in part because no matter what they support, Republicans will accuse them of ushering in socialism, raising trillions in taxes, and stripping seniors of care. Indeed, the attacks against Democratic candidates in swing and conservative districts have been fierce. Rep. John Culberson, a Texas Republican, recently released an ad claiming that his Democratic opponent, Lizzie Pannill Fletcher, “supports a complete government takeover of health care,” despite the fact that Fletcher has specifically denounced single-payer and supports “universal health care” achieved by reforming Obamacare. Progressive Democrats are running and winning on Medicare for All across the country, in deep-blue, urban districts in the Bronx and red states like Nebraska. In fact, 20% of the Democratic Congressional Campaign Committee’s “Red to Blue” candidates support Medicare for All, according to Rep. Pramila Jayapal, a Washington Democrat who founded a Medicare for All PAC last month. Meredith Conroy, an associate professor of political science at California State University, San Bernardino, and a senior adviser at Data for Progress, found that more than half of Democratic candidates in open primaries this year with policy positions on their campaign websites express support for Medicare for All. “The majority of candidates included a ‘healthcare’ section in on their issues page, and most discussed whether they support Medicare for All,” Conroy told Business Insider. But a good portion of the Democratic Party remains unconvinced that single-payer is politically feasible. They say that the issue can help Democrats win primaries, but it will hurt them in general elections – and they doubt a majority of Americans will ever support the elimination of the private health insurance market, even if Democrats amass the votes in Congress to pass it. One Democratic congressional strategist pointed to Katie Porter and Eastman, both Democratic candidates running on Medicare for All who won their primaries in red districts (Orange County, California, and urban/suburban Nebraska, respectively), as “test cases.” He argued that both candidates will face unnecessarily brutal – and effective – attacks from their Republican opponents on the issue. But Porter insists that even in Orange County, where wealthy residents might be largely satisfied with their current plans, the system ultimately fails even the wealthiest. “You simply can’t save sufficient wealth and you can’t buy sufficient insurance to cover the cost of a severely premature baby or to cover the cost of a long-term chronic cancer condition,” Porter told Business Insider. Eastman says she’s challenged some of her more affluent potential constituents to consider the systemic benefits of single-payer.